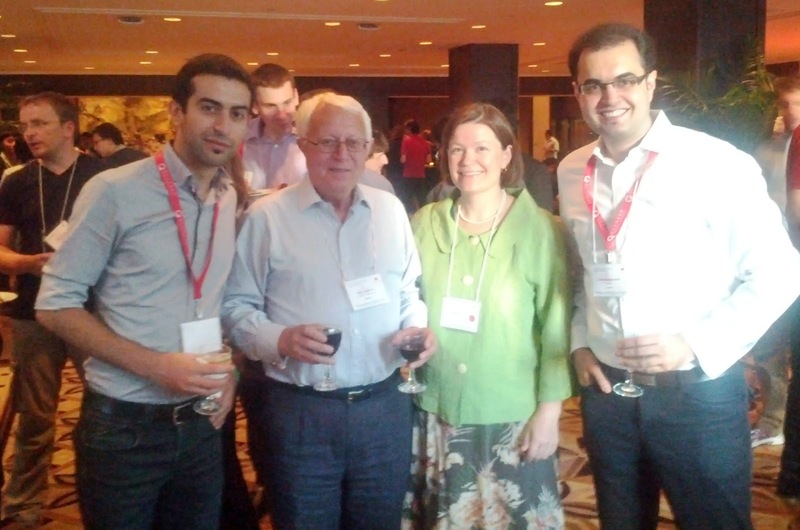 I just got back from an exciting week at the 2012 American Control Conference (ACC 2012). This year, a lot of ACC control enthusiasts were gathering for the first time outside the U.S. in Montreal, Canada, a few blocks away from the jazz festival. Working at Quanser gives our engineers the opportunity to attend such prestigious conferences as ACC, a one-of-a-kind gathering for any controls geeks and research-oriented people. I tried to divide my time between the interesting conversations at the tradeshow and the heated session presentations. The Quanser Booth drew plenty of traffic and interest. The Quanser booth at ACC 2012 saw some of the largest traffic in recent years. Some of the most well received and crowded presentations at our booth were given by Professor Nejat Olgac from the Mechanical Engineering Department of the University of Connecticut. Dr. Olgac and his former student, Dr. Rudy Cepeda-Gomez, now a professor in Colombia, have been passionately working on an interesting research topic for the past few years: time delayed systems and their applications to vibration absorption mechanisms and bioengineering. Their research has resulted in several published papers and patents. 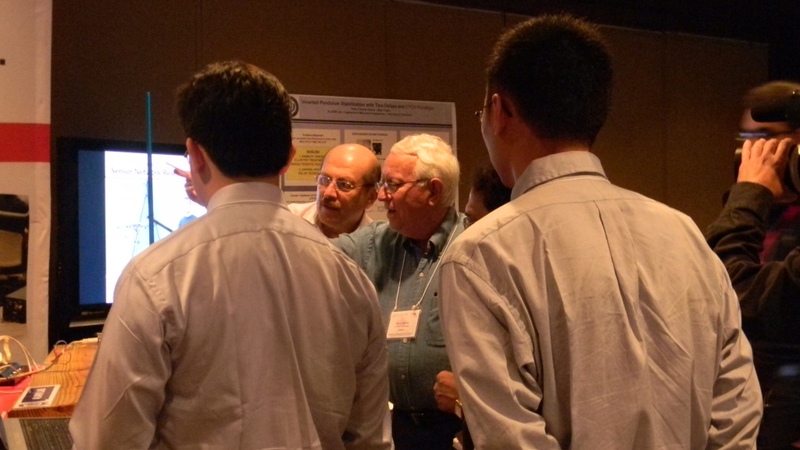 Dr. Nejat Olgac is shown presenting his work to Dr. Karl Astrom. This year at our booth, Dr. Olgac and Dr. Gomez were presenting their novel framework for stability analysis of systems with multiple time delays. Their method is called “the cluster treatment of characteristic roots” or CTCR. It is based on two fundamental propositions. The first proposition claims the boundedness of the imaginary roots of any nonlinear characteristic equation. The second proposition claims invariance of the crossing tendencies of these imaginary roots in the s-plane. This approach has enabled them to determine the closed-loop stability region of Quanser’s Inverted Pendulum in the domain of time delays for two of the states of the system. After deriving the theoretical stable regions using CTCR for Quanser’s Inverted Pendulum, they demonstrated experimentally that increasing the delay parameters would still result in some combinations of parameters that would maintain the stability of the system. Their results were hotly debated among professors and students. Attendees were deeply engaged with the presentations and discussed them with great passion. As a second demo experiment at our booth we were presenting our Iron Bird concept for teaching and researching unmanned aerial systems. Over the course of many years of research and development at Quanser, our engineers have realized that Iron Bird is a crucial and incremental step towards deploying a fully functional and stable unmanned aerial system. The Iron Bird we presented at ACC 2012 consists of three independently instrumented and actuated gimbals adopted from Quanser’s 3 DOF Gyroscope. A Quanser HiQ Gumstix sits at the center of the gimbals as part of a larger hardware-in-the-loop simulation. The gimbals can exhibit different roll, pitch, and yaw motions which are measured by the IMU onboard HiQ and are used inside the visualized simulation of the Quanser Qball. The premise is that once the students fully test and design their controllers on the HiQ unit, they can detach that unit and mount it on a real UGV or UAV for full deployment. This demo was well received among the unmanned systems community at the ACC. Quanser's Mahyar Fotoohi is shown discussing the Iron Brid concept with an ACC attendee. At right, in the background, a Quanser 2 DOF Helicopter is seen. Quanser’s 2 DOF Helicopter Experiment could be found a few centimeters away from our Iron Bird demo, yet it wasn’t in our booth. It was actually demonstrated by our colleagues from National Instruments (NI) in their booth. The 2 DOF Helicopter has been one of Quanser’s popular experiments not only for teaching but also for research. 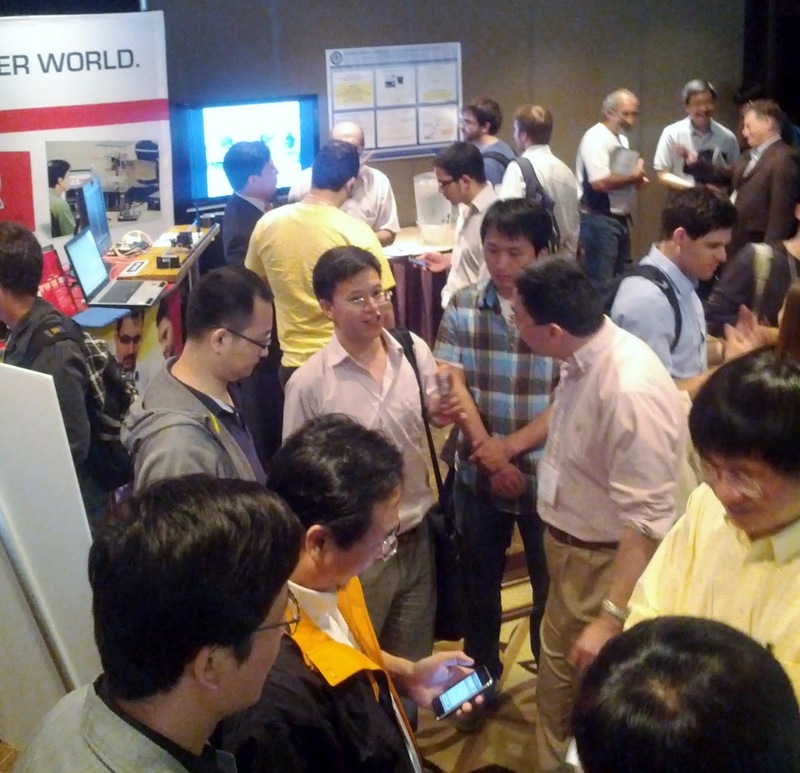 At the NI booth the experiment was controlled under LabVIEW™, using NI CompactRIO. Did I mention that this experiment will have a comprehensive LabVIEW-based curriculum developed at Quanser too? During the night, my Quanser colleague Pasha Javid and I were spending our time on a secret R&D demo we were planning to demonstrate at the ACC. We had “stolen” a Jaco robot from our R&D department. Using an iPhone, QUARC® and LabVIEW™, we were trying to implement the chicken head concept in a matter of a few hours. After all, rapid controls prototyping under LabVIEW™ and QUARC® is a given at Quanser. We wrote the program partially on our way to Montreal in the car and partially at the hotel. Pasha has been pushing for this demo for years and when Peter Martin, another Quanser colleague, brought up the idea again, we just could not resist making it. In the picture below, the robot arm is not grounded and can be freely moved in the air. The iPhone at the end-effector sends back the accelerometer and gyro data to the controller in the PC. The controller then tries to maintain the orientation of the end-effector. 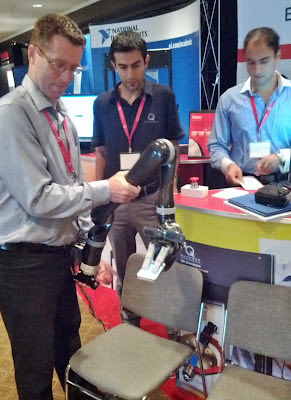 Quanser's Director of Business Development Keith Blanchet is shown testing the Jaco robot arm with an iPhone at the end-effector. With him are Quanser colleagues Pasha Javid, Applications Engineer, and Mahyar Fotoohi, Academic Solutions Advisor, Canada. I should mention that the Quanser booth was very well-decorated with demos and educational materials this year, thanks to our Marketing team. The picture below shows Dr. K. Tanaka from Japan, who wanted to have a photo in front of our booth. 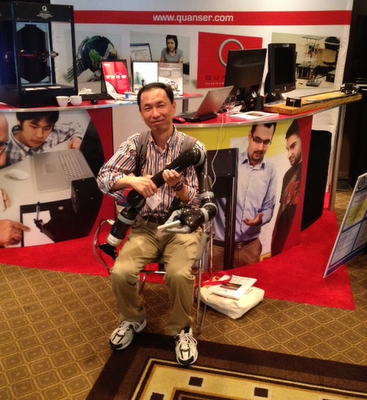 Dr. K. Tanaka from Japan is shown with the Jaco robot arm at the Quanser booth. L. Acho and G. Pujol from Universitat Politecnica de Catalunya, Barcelona, Spain have employed Quanser’s Shake Table and the Active Mass Damper experiment to design and validate their adaptive Hinfinity controller. This robust controller is composed of two terms: a linear term (robust dynamic control) designed based on Linear Matrix Inequality (LMI), and an adaptive term (sign function of velocity). Using Lyapunov theory they have proved BIBO-stability of the closed-loop system. R. Serhal and H. Khalil from Michigan State University have investigated an interesting problem: to apply Extended High Gain Observer (EHGO) to Underactuated Mechanical Systems. They used Quanser’s Rotary Inverted Pendulum as a perfect example of an under actuated system. The experiment was used in a gantry control mode and the benefits of using EHGO for disturbance cancellation was demonstrated. Abbas Chamseddine et Al. from Concordia University proposed a flatness-based trajectory planning for a Quanser Qball actuator and system constraints are considered. They have implemented and compared Linear Quadratic Regulator and Sliding Mode Controller. The latter proves to be more suitable for aggressive maneuvers due to the fact that it is based on the nonlinear model of the Qball. M. Odelga et Al. from Ecole Centrale de Nantes, France, have proposed a new autopilot control scheme and tested it experimentally using Quanser’s 3 DOF Helicopter. Travel and elevation controllers are based on adaptive sliding mode control. According to the authors, this class of controllers keeps the robustness feature of sliding mode while reducing the chattering by online adaptation of the control gains. What is more interesting is that the adaptive version of sliding mode control does not require any knowledge of uncertainties/perturbations. D. A. Dirksz et Al. from Eindhoven University, Netherlands, described the standard notch filter in the port-Hamiltonian (PH) framework. They investigate their results using simulations that are based on an experimental manipulator from Quanser. A notch filter blocks signals of specific frequencies. By having a PH description of the notch filter, it can be interconnected (in a passivity-preserving way) to passive nonlinear systems and preserve the passivity property. The analysis and control of nonlinear systems can benefit from this passivity property. They also investigate the inverse notch filter which passes signals of specific frequency. Torsten Liesk et Al. from McGill University have developed a controller suite for an autonomous, finless airship. They used Quanser’s ALTAV MkII for testing and validation of their proposed control scheme. Their controller is capable of autonomous way-point tracking and hovering. Investigating and understanding of the impact of wind gusts on the control performance is the subject of their future research. After the presentations there was time to socialize and continue discussions. Shown here are Quanser's Pasha Javid and Amin Abdossalami, with Dr. Karl Astrom and a guest. In conclusion, ACC 2012 was a great reunion and featured a wide range of presentations and hotly debated control topics – everything you’d want in a controls conference. I came away thinking that ACC discussions and papers are trending towards applications-based and hands-on control. The trend is a welcome one and certainly aligns with our guiding pedagogical principles at Quanser. No wonder I can’t wait till next year’s conference!